am getting ready to have my second baby, and I need a new stroller. functional that will fit a preschooler and an infant and fit in my car. Listen, y’all, if there’s one thing I know, it’s when I don’t know something. I, too, purchased a travel system and then became insanely interested in baby wearing because tying a Moby wrap one of 723 different ways was so much less complicated than that stroller! If there’s two things I know, it’s when I don’t know, I should ask an expert!! It just so happens that one of our fabulous sponsors is BabyBlossom– so their owner, David, took this question on for me! For many people, it’s easier to buy a car than a stroller. Add a second child into the equation and things get even more complex. baby’s age. For this conversation, we’ll skip talk about the jogging stroller. 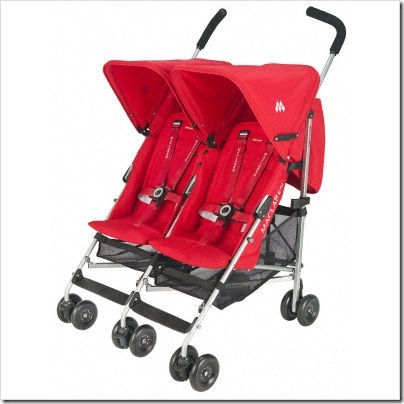 Moving on to a double stroller, there are many, many options. But let’s focus on some of the preferences you mentioned: Lighter weight and compact (and appropriate for two). If you think you’ll be rolling along sidewalks and at shopping malls (smoother surfaces) then the Baby Jogger City Mini Double and the Maclaren Twin Triumph immediately come to mind. They’re compact (about 25 lbs or so), easy to fold, and can accommodate a newborn (with some extra head support). The City Mini Double can take one infant car seat (with an optional adapter). If you can wait until the baby is about three months old (when he/she can the head up) then the Kinderwagon Hop could work. It’s about the size of an umbrella stroller but has two (front-to-back) seats that each handle 40 lbs. At 22 lbs, it’s about the lightest double stroller on the market. increased storage)and cost then there other strollers to check out: Baby Jogger City Select, UPPAbaby Vista, Britax B-Ready, Phil & Teds Explorer to name a few. matter). If your #1 child is in the 3-4 age range then this could be especially important. Comments/Suggestions? Share them below!! Thanks so much to Baby Blossom for their help with this question!